DreamWorks Animation and the director of Madagascar invite you to meet a most unusual baby. He wears a suit, speaks with the voice of Alec Baldwin, and stars in the animated comedy, Dreamworks’ The Bossy Baby. The Boss Baby is a hilariously universal story about how a new baby’s arrival impacts a family, told from the point of view of a delightfully unreliable narrator, a wildly imaginative 7 year old named Tim. With a sly, heart filled message about the importance of family, Dreamworks’ The Boss Baby is an authentic and broadly appealing original comedy for all ages. My crew loved, loved, loved it! Alec Baldwin is superb! If you were a fan of 30 rock, you will totally get it! Imagine Jack Donaghy as a baby. HIL-AR-IOUS! I had several LAUGH OUT LOUD moments. In my mind, I am still laughing. My kids, who have no idea who Alec Baldwin is, loved it, too. They were mesmerized by all the action packed scenes. So much so, that a week later they are still talking about pirates, the cool talking alarm clock and learning to ride a bike without training wheels. Oh yeah, and they want me to teach them how to write a memo just like Boss Baby talked about in the movie. Was their singing: NO, just dialogue. Was the movie too long: It wasn’t bad.. it did drag a ​teeny, ​tiny bit. – ​L​oved that the movie was told from a kid’s perspective. This made it ​totally ​relatable for my kiddos. – ​L​oved how siblings work together to achieve a goal. – ​L​oved how the movie touches on family (love and togetherness) vs. work (promotion, corner office, portrait on the wall, big party) – GOOD REMINDER for parents struggling with this. – ​L​oved the ending. Tim is older and telling the story to his daughter…. Overall, I thought the movie was great! 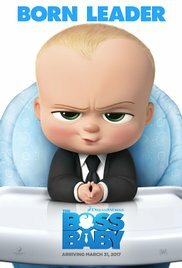 If you are looking for a fun family outing, The Boss Baby opens in theaters Friday, March 31st.